Whether you’re working with difficult-to-transduce cells like primary T-cells or just want to ensure high transduction efficiency, SBI’s TransDux™ reagents are ready to deliver. Our newer TransDux MAX Lentiviral Transduction Reagent can increase transduction efficiencies by up to 8-fold compared to polybrene, while our original TransDux formulation (Cat# LV850A-1) is still available for researchers who are not yet ready to make the change. Ensure reliable and efficient gene delivery with TransDux MAX. TransDux MAX comes in an easy-to-use, two component format (TransDux and MAX Enhancer) good for 100 transduction reactions*. Simply mix both reagents into conditioned media from target cells (Figure 1), and infect with your lentivirus of choice for a higher level of transduction efficiency. Figure 1. TransDux MAX has a quick and easy workflow. Figure 2. TransDux MAX delivers even higher transduction efficiencies than the original TransDux reagent. SBI’s BLIV713 pre-packaged lentivirus (CMV-Luciferase-EF1a-copGFP-T2A-Puro) was transduced into HT1080 cells using either TransDux MAX, TransDux, or polybrene. Cells were imaged for GFP expression 72-hours post-infection. (Left panel) Microscopy of transduced cells. (Right panel) qPCR-based quantitation of virus infectivity. TransDux MAX provides 4-fold higher infectivity than the original TransDux Reagent, and 8-fold higher infectivity than polybrene. Figure 3. 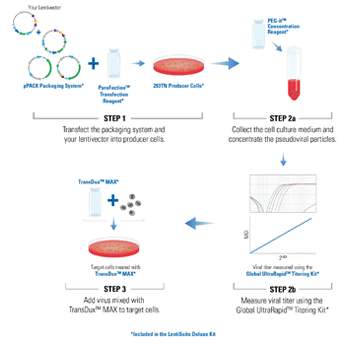 TransDux MAX delivers high transduction efficiencies across a broad range of cell types. Transduction of SBI’s LV605 pre-packaged virus (MSCV-GFP-T2A-RFP) into various cell lines (HT1080, HepG2, and Jurkat T-cells). Cells were imaged for RFP expression 72-hours post-infection. TransDux MAX clearly delivers more RFP-positive cells than TransDux in all three cell lines tested. Figure 4. TransDux MAX works with hard-to-transduce lentivectors. Transduction of a custom lentivirus construct expressing GFP and a transgene-of-interest into HT1080 cells using either TransDux MAX (left panel) or the original TransDux reagent (right panel). Cells were imaged for GFP expression 72-hours post-infection. TransDux MAX is able to deliver transduced cells even when the lentivector is too difficult for the original TransDux reagent to transduce.